My books present state-of-the-art information, but state-of-the-art changes with time. In the years after each publication, certain ideas are proven better or worse than previously supposed. Each of my books, therefore, contains certain information that I now believe to be mistaken, or at least I wish I stated it differently. When this change of heart occurs I call attention to it in the next edition of the book (if there is one) and on the colortheory list. With respect to the latest title, I list known problems here. Up until now, however, they’ve been cosmetic, not substantive: places where I referenced the wrong figure number. The first real change of heart is a minor one. It pertains to noise reduction settings in raw modules, which is discussed in the second half of Chapter 14. Only the Adobe products, Camera Raw and Lightroom, are covered because I haven’t tested other products enough to be sure that the same conclusions apply. Sharpening and noise reduction should not, in theory, be done so early in the correction process, because they may pre-empt more effective sharpening and noise reduction later. In both cases the key is to apply as much as possible without going overboard. Oversharpening leaves ugly artifacts. Overcompensation for noise makes the image too soft. The types of things that the PPW does exaggerate these defects. Therefore, if we apply sharpening or noise reduction early, we have to be ultraconservative and assume that we will have to apply more later. Unfortunately, the early sharpening/noise reduction can make the later moves more difficult. Early sharpening puts in artifacts that can get in the way of later sharpening. Early noise reduction disguises the noise and may make it more difficult to reduce later. Or at least, so goes the theory. The two topics diverge in two senses. First, every image requires sharpening, but not every one requires noise reduction. Second, although Photoshop proper is very poor in both disciplines, a beginner can still use an action like the PPW panel’s Sharpen 2013 to get a high-quality sharpen. There is no good automated method of noise reduction within Photoshop (some third-party products claim to have it, but I can’t verify this). So, the objection to early noise reduction can apply only to experienced users, because beginners can’t do better anyway. For these reasons, I made a blanket recommendation that sharpening be turned off in the raw module. It’s never beneficial, and it can hurt by limiting the superior sharpening that can be done later. This is still my recommendation. I personally keep noise reduction off but I don’t advocate that you do the same without some thought. The default is unlikely to do much harm. It can, however, make it harder for a skilled person to take out noise later, because it attacks certain things that aren’t really noise and thereby disguises the real target. Uses: If you rarely find noise to be a problem, turn it off. If you never intend to reduce noise manually because you can’t afford the time, leave it on. If you are confident in your ability to manage noise and are willing to take the time to do so when objectionable, turn it off. Upon further review, I adjust the above slightly. Many cameras have their own noise reduction, leaving us with a problem of softness, not noise. If that describes your situation, then certainly you should turn the raw-module noise reduction off, as it can only make matters worse. For everybody else, however, early noise reduction can make things better–if we would have to intervene later without it, but using it does just enough to prevent that necessity. It can also, in principle, make matters worse if it confuses things enough that the remaining noise can’t be eliminated effectively later. The question is, how big a problem is that? Is it enough to forego the possible advantages? In the book, I show examples of how too-early sharpening can hamper things. I have been looking for a similar example for noise reduction: a case where early noise-reduction makes later moves more difficult. I haven’t been able to come up with a case, and I handle raw files from more cameras than almost anybody else. So I conclude that if the problem even exists, it isn’t big enough to outweigh the possible benefit of eliminating the need for any noise reduction at all. The Adobe defaults work fine for me. UPDATE 22 AUGUST 2014. Upon further experimentation I found two cases where early noise reduction was harmful. Both photos were taken in extremely poor lighting conditions, so they aren’t particularly important in the overall scheme of things. One was a night shot of an amusement park with lots of garish neon creating difficulties. The other was a sea- and skyscape near the Arctic Circle, taken on a very dismal day. Both, naturally, were full of noise when corrected. The early noise reduction spread some of it out rather than eliminating it; the result was harder to get rid of than simple noise would have been. Also, in the amusement park shot the algorithm mistook some of the tiny lights for noise, slightly damaging quality. Consequently, my new recommendation, as modified 8/14 is: if you never encounter a problem with noise, then you should turn off noise reduction in Adobe’s raw module. Everybody else should leave it on except for photos taken under very poor lighting, and I think that the default values are suitable. P.S. One of the more powerful Photoshop noise-reduction tools, the Dust & Scratches filter, is also one of the most misunderstood. For a discussion of how it can be used effectively and what its limitations are, click here. this reminds me of a picture I was given recently. It was underexposed (5 stops) by mistake, and with ACR’s default it looks almost uniformly black. Two faces are barely distinguishable. The Exposure slider seems to make the miracle: if one cranks it up to +5,00 an acceptable luminosity appears, albeit with tons of noise. What I discovered is that such noise can’t be tamed in ACR, at least not with satisfactory results, because it has gotten completely out of hand. Curiously, chroma noise is tougher than luminance noise. I made an experiment and developed the raw file three times, at exposure settings of 0, +2,50 and +5,00, but entered PS in Lab rather than some kind of RGB. I then filled the L channel with 50% Gray and had a look at the colors. The first version (exposure 0) is almost neutral; the one at +2,50 has color; the one at +5,00 has color AND an appalling quantity of chroma noise. While the second version is apparently a worse starting point than the one pushed to the limit, luminosity-wise, it turns out to be better. The tiny amount of chroma noise it contains can be removed in Lab by means of the Surface blur filter on the a and b channels, and a steep curve in the L channel does the trick on luminosity. I was even able to saturate colors without chroma noise striking back. Then, RGB and Camera Raw filter to reduce the luminance noise. The result is far better than anything I was able to obtain with the +5,00 version, in either ACR or PS. There seems to be a relationship between generated noise and other parameters set in ACR, which means that an “optimal setting” in different situations is probably very hard to define. This case was extreme, though, and so was the difference. Usually we don’t have to worry about such images (grossly defective due to error by photographer) because we throw them away and use something better. The lesson here is the same one shown in Figures 14.18 and 14.19. Setting full range in the Adobe modules introduces more colored noise than if the file had been acquired flat and range was set in sRGB or Adobe RGB; and *much* more noise than if the work had been done in LAB. The real-world significance is not great, because in ordinary photos we can’t tell the difference. But the technical inferiority is a useful observation in light of all the hype about data purity and why we should do as much work in raw modules as possible so that we don’t get noise and banding and halitosis and God knows what else. Your point about noise reduction in this particular image confirms, I think, these new recommendations. If we ignore noise during the correction then noise will become a problem. If we do an early noise reduction there are three possibilities. The delightful one is that it may make the noise palatable if still discernible, in which case the problem vanishes. The moderate one is that the noise persists and we have to remove it ourselves, but it’s no bigger effort than if we hadn’t done the early noise reduction. And the bad one is that the noise is still present but now it’s harder for us to get rid of. My observation is that it takes an extreme case to provoke the third possibility, which is why I recommend leaving the noise-reduction on by default, but being alive to the need to turn it off in extreme cases. The photo you have described certainly qualifies as an extreme case. So I would definitely do as much work as possible outside of the Adobe modules. Fortunately, we don’t see extreme cases very often, so the conversation is largely of academic interest. I have just discovered your excellent training resources online and I am about to purchase either Modern Photoshop Color Workflow or Photoshop LAB Color books or both, as I would like to get to grips with some of the LAB colorspace techniques you teach and I hoping you would answer several questions to help me decide? 1. How much of the 2006 LAB Color book is duplicated in the 2013 Photoshop Color Space book i.e. have most of the earlier LAB techniques been updated and included in Photoshop Color Space, therefore I don’t need to buy both books or is LAB color still more in-depth on those processes and still current for LAB techniques in CS6 so is a must purchase as well? 2. Obviously I haven’t read your books yet but I am wondering if there is any reason why I couldn’t work on the retouching files in LAB mode the whole way until the end. When retouching I tend to create a Master file with an “embedded camera profile” colourspace to preserve the exact information recorded buy the chip and when completed I copy, flatten and convert this delivery file to either Adobe 1998 or the larger ProfotoRGB. Most master files I work on are shot on a 60 megapixel chip, with multiple plates, comps and effects so that I can go back over and adjust the individual elements at will and with fresh eyes. I can imagine that on complex jobs I will be going back and forth between RGB and LAB modes to make my tone and colour adjustments if I can’t stay in LAB mode which apparently has a degrading effect, but will this be much of a problem with 200mb layers? In answer to Barry, I think it depends what your focus is. If you intend to install the PPW panel, you could get MPCW first because you don’t need to grasp all the ins and outs of the background theory to make a HUGE difference with the panel very quickly. I’m a keen hobby photographer and have had the LAB book since it first came out. The panel methodology subsumes working mainly in LAB as described in the Canyon book, though I still refer to it a lot because I like understanding the detail and referring to the amplification. You could quite happily do without it. If my assumptions are correct; buy both books as they have different approaches, mostly different materials, and you will learn more. I’d read the older book first as it lays a foundation and newer book has some newer/better information (you can discard 5% of the first book contents after you read the second book. Read the new book first and you may be more easily confused by the old book). And if you want even more, read the earlier book on Pro Photoshop. Authors are notoriously bad at answering questions about how their offerings should be read, because it’s hard for them to put themselves in the position of someone who isn’t familiar with what they’ve written. A couple of readers have already commented here; on the colortheory list four more commented, appended below. Aroha’s separate reply makes the good point that if you are starting to use the PPW panel you can get good results with it without necessarily knowing why it works. Of course, knowing the gory details is beneficial, and if you are in this position, perhaps MPCW might be the place to start. Then, you simply collect all his other books going backwards in time. 2. Read MPCW, doing the exercises, but not using Photopshop at all. You can skip the second half of chapters when you feel like it. starting over at the beginning may be best. I would always advise to start with the latest Professional Color Correction book (5th edition), as it teaches all the theory of channels, color spaces and color correction techniques. It lays the fundament, so to say. Both other books should better be read after that. I myself read Dan’s books in chronological order, starting from PCC5. Although it’s hard to imagine how the experience would have been had I taken a different order, I found this a very effective learning path. I’ll throw my two cents into this discussion. Begin with the Lab book. Then you get that out of the way, and you have Lab under your belt. Without knowing how to read numbers in Lab, the other stuff will be much more difficult. If you know Lab numbers, you won’t be scratching your head all the time wondering what Dan is talking about in his other books. This is why I got through that book right away. Next, get into the Professional Color Correction book. Now that you know the Lab color space, you can start measuring color values quickly, and also learn all the other stuff about contrast enhancement. Keep in mind, Dan’s techniques are about speed. Reading Lab numbers to determine color accuracy is the fastest method compared with reading RGB and CMYK numbers. So, if you don’t know how to read Lab numbers, you won’t get the most out of the Professional Color Correction book. Then, finally, get into the Modern book. This book teaches you more about running the actions than it does about the nuts and bolts of the PPW and Photoshop in the way the other two book do. 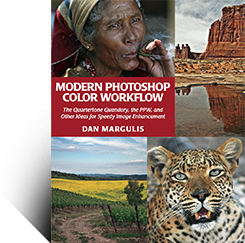 The other two books get you deep into the trenches with Photoshop. The modern book is a breeze once you’ve read the other two book at least four dozen times each. But, in my opinion, to really learn Photoshop and the PPW, you should read all three books. Also, get on Kelby training and watch his training videos there too at least 43 times each. Then you will be as good as Dan. All of this will take all of your free time for the next three years, but it’s time well spent. Dan Margulis - 25 days 16 hours : Bill, I’ve replied offline with my address.